I’ve gone back and forth for nearly two weeks on this game. At first glance, I figured the New England Patriots would easily dispatch of the we’re-just-happy-to-be-here Atlanta Falcons. Then, I started to believe in the Dirty Birds. But that belief has faded into another here-we-go-again, sinking-feeling of Patriot luck. Perhaps it’s fitting that the Celtics are unbeaten since the Patriots reached the Super Bowl, and the Bruins only suffered their first defeat last night. With celebrities backing them in full force, the Patriots are primed to put the final nail in the haters’ coffins with “#onemore” Lombardi trophy. That will give Beantown double-digits in pro sports championships over 16 years, compared to one ALL-TIME for the city of Hotlanta. What a shame. But, I’ve explained before that things will indeed be okay for me, even if I’m spot on with my prediction yet again (check out this nugget below from two years ago). Atlanta is the highest-scoring offense in football and the eighth-highest scoring unit of all time with 540 points, but we know how this goes for these high-powered attacks when they reach this stage. Especially when the offense faces the top scoring defense, which New England possesses. It didn’t work for Carolina last year, nor for Denver two years prior to that. The Falcons have a slightly better offense, but they face a significantly tougher defensive challenge than the Patriots will. Matt Ryan gets the slight nod at quarterback, but will the Falcons really have enough firepower once Bill Belichick employs his patented “take away what you do best” strategy that limits Julio Jones the way it did Antonio Brown in the AFC title game? I have a hard team believing it. New England almost never makes mistakes, and my hunch is that even though the Falcons don’t either, there will be one critical turnover that will turn the tides in this game. Look for several big plays for undersized running back Dion Lewis (boy isn’t that an overwhelming theme for Boston sports? 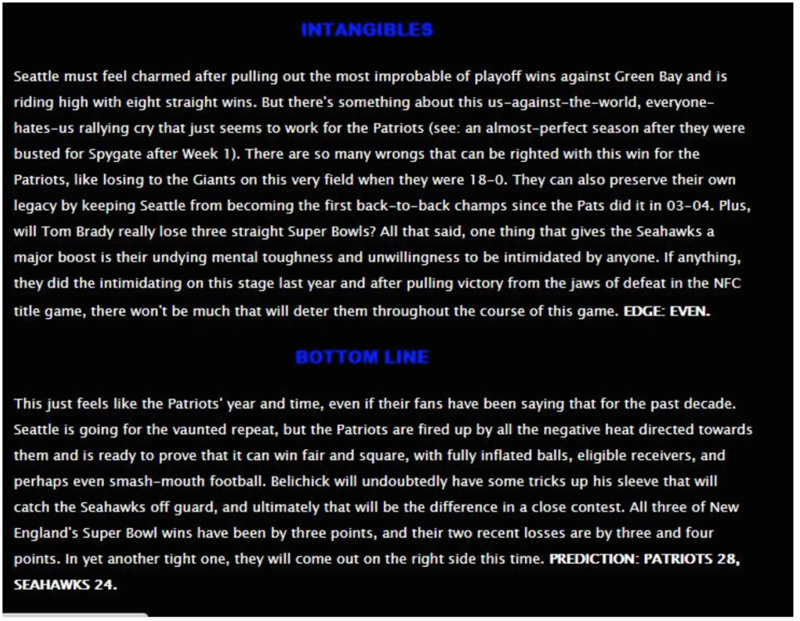 ), whom the Patriots are 16-0 all-time with in the starting lineup. EDGE: PATRIOTS. This is a mismatch. Atlanta may have the NFL leader in sacks in Vic Beasley, but overall lacks playmakers and will have a hard time with the Patriots’ quick-release, no-mistake, versatile offense. New England is the second-highest scoring offense in the NFL since Tom Brady returned from his Deflategate suspension in Week 5, so for all the talk about the Patriots’ defense not having faced an offense like Atlanta’s, the Falcons certainly have not faced a defense like New England’s this year. Unless the Falcons can play with a lead and pin their ears back on Brady, it will be much harder for them to make adjustments than New England’s defense against Atlanta’s attack. EDGE: PATRIOTS. Of all the areas where the Patriots might break the Falcons’ spirits, it’s in the kicking game. Primarily, the kick return game. The Falcons have one of the worst coverage units in football, and Lewis could exploit that, or the Pats could find some trickery to expose the Falcons’ flaws. The matchup of the kickers and punters is pretty even, but between the Falcons’ coverage issues and Julian Edelman’s uncanny ability to always make the first man miss on punt returns (or anywhere else, for that matter) is a big difference-maker. EDGE: PATRIOTS. It doesn’t seem like I need to explain much here. Bill Belichick is running laps around his competition, even though Dan Quinn is a worthy adversary, coaching in his third Super Bowl in four years. Josh McDaniels and Kyle Shanahan will both have a great game plan in place, but Matt Patricia’s defense will come up with something unique that Richard Smith’s unit won’t. In crunch time, Belichick has all the right answers. EDGE: PATRIOTS. Maybe someday soon, Brady and Belichick will ride off into the sunset, and football will become competitive again. But one, two, three, or four Lombardi trophies isn’t nearly enough. With Boston sports and its aura, Brady’s determination to officially put Deflategate to rest, and the Falcons never having been on this stage with this current regime, it would seem overwhelmingly that the intangibles favor the red, white, and blue. PATRIOTS. I am being completely truthful when I tell you that for a while I did wrestle with picking the Falcons. I’ve learned my lesson never to bet against New England (advice I follow quite literally), but there just aren’t any weaknesses on this Patriots team, even in Rob Gronkowski’s absence. As much as Patriots-haters like myself feel like we’ve paid our dues over a decade and a half, the nightmare appears to be far from over. The Patriots are as dominant at ever, even with Brady nearing 40, and as if that wasn’t enough, the Red Sox have Chris Sale, Isaiah Thomas is the under-six-foot version of LeBron James, and the Bruins are in second place despite a sub-.500 record. Affleck, Damon, Wahlberg, Evans, O’Brien, Banks, Krasinski, Carell, Burr, et al will all be singing Lord Brady’s praises across America after this one. For a change, the Patriots play in a Super Bowl not decided by three or four points. PICK: PATRIOTS 30, FALCONS 20. Be the first to comment on "Super Bowl LI Preview: Patriots High-5"